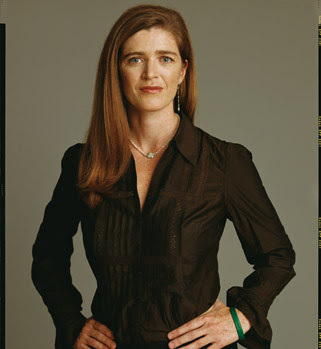 Samantha Power. Image from The 46. Barack Obama’s war in Libya bears the intellectual imprint of Samantha Power, the Dublin-born human rights author who has risen to visible prominence in the White House hierarchy. Power, who received a Pulitzer Prize for her 2003 book A Problem from Hell: America and the Age of Genocide, came of age as a freelance reporter during the Bosnian wars, when she was in her early twenties. From there she attended Yale and Harvard Law School, becoming executive director of the Carr Center for Human Rights at Harvard. She is married to Obama appointee Cass Sunstein. I remember wondering why, like U2’s Bono, another Irish human rights activist, Power has been less preoccupied by the human rights abuses inflicted by the British during the 30-year war in the northern part of her own country. If she wasn’t willing to take sides at home, so to speak, why was it easier to take sides in civil wars abroad? Wasn’t the creation of a “more perfect union” at home the foundation of any intelligent foreign policy abroad? A note from her promised more discussion on that, too. The last I remember speaking to her, Power had gone from supporting Gen. Wesley Clark’s 2004 presidential campaign to volunteering in the Washington office of a new U.S. Senator, Barack Obama. According to her account, she bonded with Obama in a three-hour policy conversation, worked in Obama’s office in 2005-6, and became a close collaborator. In 2008 Power published a brilliant and moving book on Sergio Vieira de Mello, the UN human rights representatives killed in a 2003 bombing at the UN headquarters in Iraq. The agonizing death of the UN diplomat, crushed in the debris of his building, seemed to suggest a similar fate for UN diplomacy in a time of terror. The title of the book conveyed her anguish and passion: Chasing the Flame: Sergio Vieira de Mello and the Fight to Save the World. But the agenda of the humanitarian hawks seemed off the radar as the quagmires in Iraq and Afghanistan deepened. Bringing human rights and democracy to the Middle East with bombs and bayonets was increasingly seen as a delusional folly. Foreign policy realism, not human rights, ascended in mainstream thinking. Power gained prominence as a national security strategist nonetheless, writing a comprehensive 2007 New York Times review of current books on military doctrine. While carefully separating herself from President George W. Bush’s policies in Iraq, she endorsed the Army and Marine Counterinsurgency Field Manual associated with Gen. David Petraeus and co-produced with Power’s close colleague Sarah Sewall at the Harvard Center for Human Rights. Power believed that counterinsurgency provided greater protection for civilians, despite mounting evidence of Iraq’s secret prisons, torture chambers, thousands of civilian casualties, and top-secret assassination operations carried out by Lt. General Stanley McChrystal in 2006, described in Bob Woodward’s The War Within. Liberal interventionists cringed at the outcome in Iraq, but Power apparently thought the counterinsurgency doctrine was a step towards greater emphasis on human rights. Then came this year’s Arab awakening, and the resurgence of Samantha Power. During the past year, Power was tasked by Obama to take part in a closed set of cross-agency meetings to study the dynamics of revolt, repression, and possible American responses to emerging crises in the failing autocracies of the Middle East. Now she was becoming cited as a frequent source for national security reporters, mostly off the record. 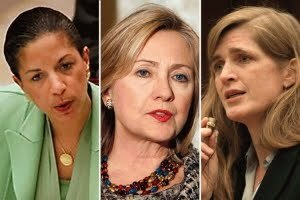 Susan Rice, Hilary Clinton, and Samantha Power. Image from Progressive America Rising. Power’s case for humanitarian intervention is serious and well researched, but subject to ambiguities. Progressives should agree with her that subscribing to the realist school of foreign policy associated with Henry Kissinger, which demotes values in favor of “interests,” is a recipe for romancing dictators. That has been the policy of the “long war on terror” which, until recently, listed Muammar el-Qaddafi as a new friend of the United States, along with old friends Hosni Mubarak and dozens of others. On the other hand, the realists are correct that U.S. military force simply cannot be applied against every major massacre across a bloody world. After expanding the definition of national interest to include preventing a slaughter in Benghazi, however, Obama adheres to the other themes of his emerging doctrine: the politics of multilateralism (the U.S. coalition would “splinter” if the mission was expanded) and the recognition of limits (primarily the costs of another quagmire like Iraq). Human rights thus becomes a triggering criteria in the application of military force, but not an exclusive one. Obama says he won’t bomb or invade Tripoli to take out Qaddafi militarily, disappointing the hawkish audience while relieving his liberal base. If the U.S. gets lucky this time, Power will be vindicated. It’s possible that U.S. air power can protect opposition ground forces on the road to Tripoli until Qaddafi’s regime collapses from within. Even then, the U.S. will have to take part in an unpredictable occupation of Libya until a new set of governing institutions are created, a process that might take months or years. The cost will climb into the billions in deficit spending while the budget crisis worsens at home. Any triumphant new U.S. allies, like the Libyan Islamic Fighting Group, will prove to be unsavory. That’s the best-case scenario for the administration. In the worst case, the human rights rationale will have served as the initial argument for another long, bloody, and expensive quagmire in a Muslim country. In a growing stalemate, the U.S. will feel impelled to escalate militarily in pursuit of its policy of regime change. That could “splinter” the U.S. coalition and violate the UN mandate, as Obama himself has indicated. It could lead to a bloodbath in Tripoli while preventing one in Benghazi. It could devolve into civil war and an indefinite power vacuum. And speaking of morality in foreign policy, what will Power advise and Obama decide when asked to prevent massacres in Bahrain, Yemen, Saudi Arabia, Syria, Pakistan, or elsewhere (anyone for intervention in China or Russia)? 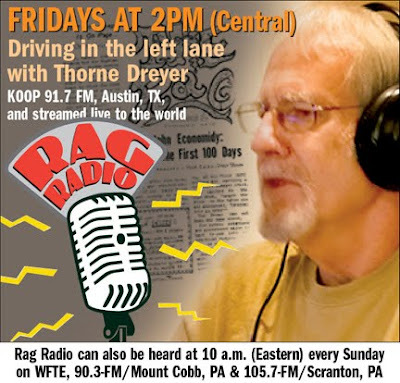 And who will remember the home front, and the Obama pledge to focus laser-like on the recession-ridden American economy? Who will address the crisis of aging nuclear power plants? Or the human rights crisis of America’s prison system, the largest in the world? Political pressure is already building to retain American troops and bases in Iraq and Afghanistan beyond the promised deadlines for withdrawal. The secret war in Pakistan has dropped off the front pages for the moment, but will surely erupt again soon. Perhaps the greatest problem in Power’s worldview is an elitism that scorns domestic policy and politics, the very domain where she believes the crusade to stop genocide is so often “lost.” Anyone primarily concerned with domestic priorities, in her view, must be an isolationist and thus an obstacle to the global struggle for human rights. One can’t imagine Power worrying very much about, say, rent subsidies or pension funds. The realities are quite the opposite. In a democracy, war requires the consent of the governed, expressed at the very least with the consent of the Congress and subject to the authorization of the federal judiciary. As Garry Wills points out in Bomb Power, the public and Congress have shriveled before the power of the unitary executive state. It is telling that Obama spent far more time seeking the approval of the United Nations and the Arab League than the U.S. Congress, and has no plans to seek an authorizing vote unless Congress itself insists -- an unlikely prospect for now. And as David Rothkopf writes in his aptly-titled history of the National Security Council, Running the World, all 13 Democratic and Republican national security advisers since the 1970s -- from Brent Scowcroft to Stephen Hadley -- are a “natural aristocracy” who either worked for Henry Kissinger or one of Kissinger’s top associates. The foreign policy caste worries about the intrusion of democracy on their domain (Harvard’s late Samuel Huntington used to complain about “an excess of democracy” after the Sixties, when curbs on foreign policy were briefly legislated). In their privileged world, they assume an unlimited budget for their unlimited foreign policy portfolio. According to Woodward’s account, Obama himself had to fight his own bureaucracy to uncover the true costs of Afghanistan, and the price was a shock to the president. Obama is ill-advised on foreign policy if his national security elite, including idealists like Power, assume that Americans will have to accept a declining standard of living to put a stop to dictators abroad. Human rights abroad cannot come at the price of democracy at home, but that is the course of liberal empire. As Power wrote to me in a 2003 note, “With so many problems in hell, where are the Irish when we need them?” It was written in jest. But the answer is a serious one. The Irish are 10 years into their peace process, and the Dublin government has been voted out of office for economic failures.